When the installation is completed, start Microsoft Word. You should see Sunda Doc both in the context menu (see image) and as a new toolbar under the Add-Ins tab (see image). If Sunda Doc does not appear after the installation, restart your computer. The User Guide provides information about the product features. If Sunda Doc cannot connect to the translation server, please check that your computer's firewall settings do not block Microsoft Word's access to the Internet. Run the installation file (SundaDocOO-en.oxt) and follow the guided setup program. When the installation is completed, restart the OpenOffice application. After a successful installation you will see the Sunda Doc toolbar in the OpenOffice Writer and Impress applications (see image). If the Sunda Doc toolbar does not appear, check that the Java Runtime Environment (JRE) is in use in OpenOffice. Run the installation file (SundaDocOutlook-en.msi) and follow the guided setup program. When the installation is completed, start Microsoft Outlook. 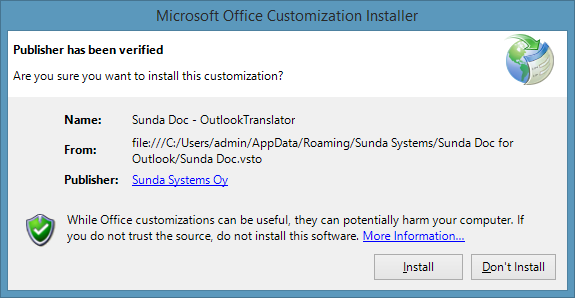 After a successful installation you will see the Sunda Doc tab in Outlook (see image). If Outlook asks you to confirm the installation, click 'Install' in the confirmation dialog box (see image). The Outlook version requires that you have the Microsoft .NET Framework 4 or later installed on your computer. Try translations by entering a sentence to the text area. With our products you can translate longer texts and documents. To try the products, sign up for a free trial. 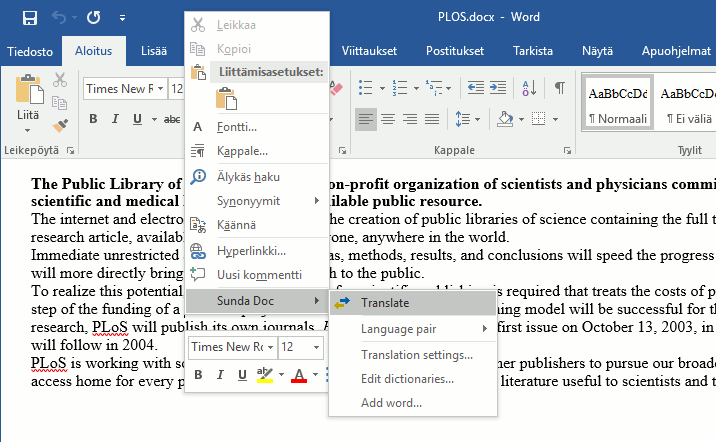 Use the Sunda Translator in SDL Trados Studio 2019. Contact our Customer Service for a free trial.